In 1912, the Elmhurst City Council passed an ordinance that established a public library and an annual tax levy to support the library. The mayor appointed the first nine-member Library Board. Over the next few years the Board wrote bylaws and looked for a suitable place to open the library. On March 22, 1916, despite a snow storm, the Elmhurst Public Library opened to a crowd of 100 in a small room in the rear of the old Glos Building at York and Park Avenue. The room was rented for $15 per month. Katharine Breitenbach, the first librarian, was paid a salary of $15 per month, and $5 a month was paid for janitor services. The Board spent $400 to buy books and magazines. The Elmhurst Woman’s Club donated $75 for the purchase of children’s books. The library began with 830 books and was open only ten hours a week, on Wednesdays and Saturdays from 2-5 p.m. and 7-9 p.m. The library’s equipment included a new typewriter. In the first annual report published in the Elmhurst Press in 1917, the library’s collection had grown to 1,507 volumes, 12 magazine subscriptions and 643 registered borrowers. That first year library books circulated 10,400 times. A volunteer from the community offered all children in third and fourth grades a story hour on Saturday afternoons during the summer vacation. During World War I, the library distributed food pamphlets, government bulletins and collected, with the help of school children, over 1,000 books for soldiers’ camps. In 1919, the Library Board appointed a committee to look for land suitable for a public library building. In 1922 the library moved to the first floor of the former Wilder home which was purchased along with an acre of land from the Park District for $14,000. The house was built in 1868 by Seth Wadhams and was called “White Birch.” Later, the Henry W. King family used the house as a summer home. In 1905, Thomas E. Wilder bought the house and called it “Lancaster Lodge.” The library was now open to the public on Mondays, and story hours were given throughout the year. According to a report in the Elmhurst Press, during the 1923-24 school year over 1,200 children from first to sixth grade attended storytimes. Folk and fairy tales were told to the younger children while older kids heard the stories of such operas as The Flying Dutchman and Hansel and Gretel. In 1923, the second floor of the library was opened for community groups, such as the Elmhurst Woman’s Club and the Girl Scouts, to meet at a fee of $10 a month. At this time many of the library books were purchased from Marshall Field and Company. 1926 was a watershed year for the new library. Ten years after the library opened, a new head librarian, Miss Grace Murray was hired, and the library extended its hours to all day Monday through Saturday, except at lunch and dinner time. That same year the library purchased a telephone, and residents were encouraged to call “Elmhurst 1245” for information about books and library services. Also in 1926, the first summer reading program began. In the “vacation reading” program, children entering fifth grade had their name displayed in the library for reading 10 books. According to the annual report of 1927, over 2,100 people were registered borrowers and the library held 6,431 volumes. The new hours caused the library’s circulation to jump to 50,019 that year. During the 1926-27 school year 1,668 books were sent to Elmhurst classrooms. In 1930 fire damaged the library. The building was rewired and redecorated, and for the first time part of the second floor was used for an adult fiction collection. The original drawing room of the home, now the Wilder Room, was used as a children’s room. The adult nonfiction collection was kept on the first floor. An extension phone was installed to talk between floors. Pillars and a south wing were added to the building in 1937. The budget submitted for 1930-31 fiscal year included $5,300 for staff salaries which included the librarian, assistant librarian, other assistants and a janitor. The Library Board budgeted $3,000 for books and $100 for newspapers and magazines. In 1930, to meet increasing space needs, the Library Board established a building fund. By 1931, the collection had grown to 10,500 volumes and 5,200 people had library cards. In June 1936, as part of Elmhurst’s Centennial celebrations, the cornerstone of a library addition was laid. At the time of the ceremony, the library had over 17,000 volumes. Library books circulated 122,000 times. The remodeling project took 8 months to complete and temporary quarters on East First Street were set up for a few months. On January 31, 1937, about 1,000 people attended a special open house to see the renovations. After the remodeling, residents checked out books in what is now the audiobook area outside the Wilder Room. The outside porches were removed. Pillars and a south wing for a new children’s room were added increasing the size of the building to 10,750 square feet at a cost of $36,000. A fireplace near the entrance was removed to make room for a check-out desk. On February 1, 1937, when the library reopened for regular business, 954 books were checked out that day alone. More than 8,000 people, over half the population, now had library cards and the library was open every day except Sundays including meal hours. On March 23, 1941, in celebration of the library’s 25th anniversary, the Friends of the Elmhurst Public Library was formed. In April 1947, the Friends helped the library start a circulating record collection by contributing 380 classical records. During World War II, the Elmhurst Public Library, with the help of the Friends, joined the Elmhurst College and York High School libraries in the nation-wide Victory Book Drive. Elmhurst citizens collected thousands of books for soldiers at USO centers, military camps and training stations. During the 1940s a Great Books lecture series began. 1952 marked the first year that the Garden Club began their annual tradition of decorating the library during the winter holidays. On May 20, 1955, during the annual meeting of the Friends, the Alice Seton Berens room on the lower level of the library was opened in honor of Mrs. Berens’ 35 years of service on the Library Board. In 1960 the Library Board commissioned a building study which concluded that a substantial amount of additional space was needed for library services. A new building was preferred, but building an addition was another option. In 1963, the citizens of Elmhurst voted to approve a $500,000 bond issue to build an addition to the library. At the time of the referendum the library served over 19,000 library cardholders and owned over 40,000 volumes. The addition increased the size of the building to 42,750 square feet. A dedication ceremony was held on October 17, 1965. The collection grew that year to 51,200 volumes. From 1965-75, before moving to the Glos Mansion, the Elmhurst Historical Museum was located on the top floor of the library, where the Periodicals Room is now. The new children’s room was named after Librarian Ruth Strand who had worked at the library since the 1920s, first as a page and then as Assistant Librarian and Head Librarian. In 1970 volunteers began delivering library material to home-bound residents. In January 1972 the Elmhurst Public Library joined the Suburban Library System (now called the Metropolitan Library System) which gave residents access to materials from over 50 other libraries in the system. In the early 1970s a paperback book collection was begun. In 1975 the library installed an automated circulation system which computerized patron records and library holdings. Beginning in 1976 the library was open to the public on Sundays during the fall and winter months. By 1979 the library was hosting Lyric Opera lectures. In March 1986 Elmhurst voters approved a referendum to raise the library’s tax levy. The first Stories in the Park Storytelling Festival was held in Wilder Park in 1986. In 1989 the statue Once Upon a Time was unveiled in the library’s west garden, the first piece of public sculpture in Elmhurst. The library continued to keep up with changing technology. Beginning in the late 1970s, cassettes, videos, audiobooks, CDs, DVDs, computers and Internet access were added. In 1994, the card catalog was replaced with computer catalogs. Online databases now provide up-to-the-second information on a wide range of topics. The Library’s website offers access to the catalog, reading suggestions, online databases and more. By the dawn of the new millennium, library books numbered over 240,000 in a building intended for a maximum of 120,000 volumes. EPL was busier than ever. Circulation skyrocketed to over 794,000. Over 4,000 children and hundreds of teens and adults joined the Summer Reading Program each year. With online databases, thousands of magazine and newspaper articles are just a click away. In the early 1990s, a building study helped the Library Board determine the best use of its current building, the Wilder Mansion. The study concluded that the mansion—originally intended as a home, not a library—was incapable of supporting the weight of the Library collections. The Board reviewed options for obtaining additional space and agreed unanimously to study the feasibility of a new building. Shortly thereafter, the presidents of the Elmhurst chapters of the League of Women Voters and the American Association of University Women (AAUW) appointed a joint committee to study the space needs of the Library. The group compared EPL’s patron visits, square footage, circulation, and collection size with similar Chicago-area libraries. The study concluded that a new building was needed. A request for proposal was sent out in the late 1990s, asking architectural firms interested in building a new library to submit proposals. Over the next few months, EPL’s Board reviewed the firms and narrowed the choices to five. In December 1999, Lohan Associates was chosen. Lohan studied the character of buildings in the vicinity of the new Library location to determine what style of architecture would fit into the area. The architects noticed that all of the buildings in Wilder Park were white or light in color. Surrounding the park, other buildings like the ones at Elmhurst College, churches, and schools were constructed from red brick. Lohan architects suggested EPL be built with light-colored stone in keeping with the color scheme within Wilder Park. In June 2000 the Park District board, Library Board, and City Council signed a land exchange agreement. In exchange for land on the north end of Wilder Park on which the Library could construct a new building, the Library gave the Park District 94,000 square feet of library-owned land in the center of the park, including Wilder Mansion. This set in motion plans for the new building. First, however, Elmhurst residents would need to vote on a referendum proposing a bond issue to fund a new facility for Elmhurst Public Library. 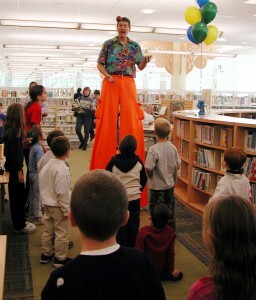 In December 2000, the city council approved the Library’s proposed referendum, sending the decision to voters in April 2001. Over the next four months, the community attended public hearings, learned about the conceptual design for the building, and prepared for the vote. 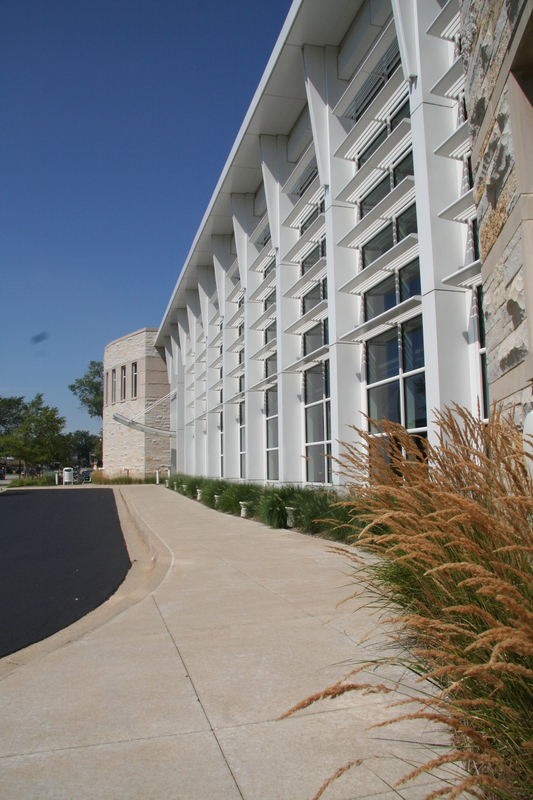 In April 2001, a new chapter opened for Elmhurst Public Library as Elmhurst residents approved an $18.7 million bond issue to build a new 80,000 square foot building on the northeast corner of Wilder Park. A groundbreaking ceremony on May 10, 2002 kicked off Elmhurst Public Library’s building project. The Library Board of Trustees, Mayor Thomas Marcucci, and Architect Dirk Lohan had shovels in hand to break ground. The building contract went to Power Construction Company of Schaumburg and work on the building began. During June and July 2002, the foundation was installed. By the end of October 2002, steel, concrete, and masonry work had begun. Mechanical, electrical, and plumbing was also roughed in by the end of 2002. Interior framing began in November and continued through March 2003. By January, the building was “under roof,” and over the next two months, workers concentrated on the mechanical, electrical, and plumbing work. During a farewell ceremony on September 7, 2003, the community gathered to say goodbye to the Wilder Mansion, home to EPL for more than 80 years. Over the next month, professional movers relocated more than three miles of library books, materials, furniture, and equipment to the new building at 125 S. Prospect Avenue. In the new building, books were shelved, computers were installed, furniture was moved, and staff prepared for opening day. On October 4, 2003, the sun was shining, the Elmhurst College Jazz Quartet was playing, and hundreds of Elmhurst residents gathered to celebrate the opening of the new Elmhurst Public Library. A “book brigade,” made up of dozens of Elmhurst residents lined up along Prospect Avenue, passed the last book from the Wilder Mansion to EPL’s new building. The last book—The Library by Sarah Stewart—was passed to Mayor Thomas Marcucci, and the reshelving of the books was complete. Boy Scout Troop #78 raised the flag, and the Girl Scouts of Edison School sang America. After remarks from Library Board President James Wall, Architect Dirk Lohan, and Mayor Thomas Marcucci, the mayor cut the ribbon, and the crowd streamed into the new building. On opening day, more than 5,500 items were checked out, more than 100 patrons signed up for new library cards, and over 1,700 people attended the special programs during the following week. Donors across the community “bookmarked” their place in history by dedicating a square foot of the new library. 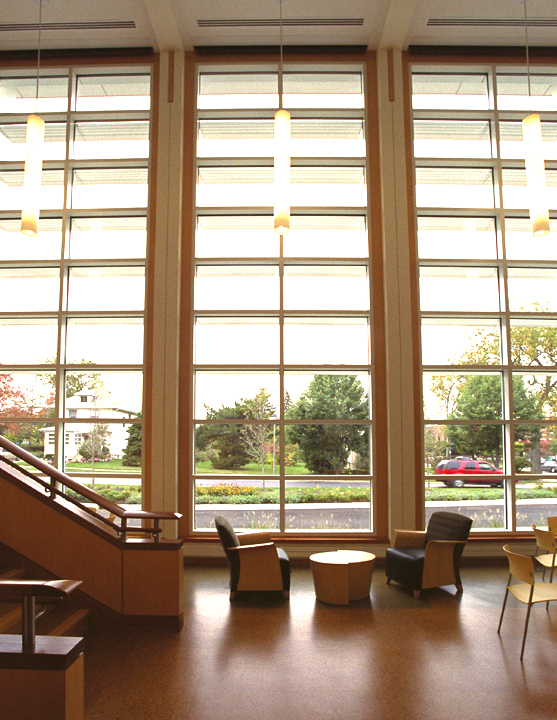 In November 2003, EPL offered a new service to patrons by opening a coffee shop in the lobby of the new building. Gourmet coffee, fresh muffins, juice, and more would now be available to patrons. 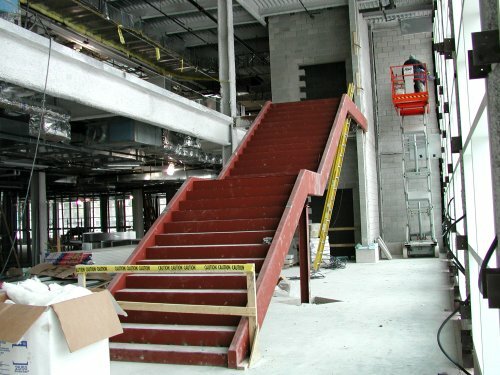 By May 2004, the Elmhurst Noon Lions Club donated equipment for a Special Access Center on the second floor of the building near the Silent Study Room. Assistive technology software, equipment, and computers allow patrons with sight impairments or other disabilities to access a wide range of materials. In the summer of 2005, the Elmhurst Garden Club donated two dragonfly benches and a butterfly bench to enhance the Library’s outdoor John Carroll Memorial Children’s Reading Garden. Also in the summer of 2005, EPL celebrated its 20th Annual Stories in the Park, hosting storytellers and musicians. Summer reading programs for all ages continued to draw thousands of participants at EPL, always nearing the 5,000-child mark for summer reading sign-ups. In 2008 and 2009, EPL continued growing in technology. In January 2008, patrons were able to access their library accounts, pay their fines, and keep track of their reading histories online. In March 2008, children had access to online books through BookFlix and Tumblebooks. The popular Playaway collection of audiobooks debuted in the Kids’ Library in 2007, and in July 2008 was expanded to include titles for adults. March 2009 was the start of 24/7 Library and research access on EPL’s website. Social media expanded the Library’s reach to the community in subsequent years. A room in the Kids’ Library, previously used as a Silent Study Room, was transformed into The Learning Garden in 2010. This new space was created to foster early literacy, a love of reading, and school readiness skills. In January 2011, the Small Meeting Room was renamed the Kossmann Room in recognition of a gift from long-time Elmhurst resident Liesel Kossmann. She dedicated the room to her family, especially her father who was an avid reader. On July 29, 2011, Mary Beth Campe took the helm of Elmhurst Public Library. Campe became director after Marilyn Boria retired in July 2011. Boria’s 27 years of leadership spanned a transformational period for EPL. During her tenure, collections, services, and technologies were added, and a new library was built to meet evolving needs. As a result, EPL was recognized numerous times as one of the top libraries in Illinois and the nation. As EPL neared its decade anniversary in the new building, the Library continued growing to meet patrons’ needs. By the end of 2011, EPL had embraced new technologies, making eBooks and eAudiobooks available to patrons. In January 2012, EPL started loaning out 30 preloaded eReaders. By the end of 2012, eBook checkouts had increased by a whopping 353%. The RFID project was complete by the summer of 2012, allowing greater access to self-checkouts. In January of 2013, a new service of wireless printing was available to patrons. As the years ticked by, the Library continued receiving high marks from the HAPLR index, ranking EPL the sixth-best library in the nation by 2005. From the summer of 2004 to the summer of 2005, half-a-million patrons visited the Library. Also in the summer of 2005, EPL celebrated its 20th Annual Stories in the Park, hosting popular storytellers and musicians. Summer reading programs for all ages continued to draw thousands of participants at EPL, always nearing the 5,000-child mark for summer reading sign-ups. Elmhurst Public Library was named one of the top 100 workplaces for 2012 by the Chicago Tribune. This distinction is awarded to companies whose employees highly rank their workplaces in terms of organizational health and employee engagement. The Top Workplaces are determined based solely on employee feedback. $5-$9.9M category, with notably high visits and circulation. As EPL neared its decade anniversary in the new building, the Library continued growing to meet patrons’ needs. By the end of 2011, EPL had embraced new technologies, making eBooks and eAudiobooks available to patrons. In January 2012, EPL started loaning out eReaders, donated by The Friends of the Elmhurst Public Library. By the end of 2012, eBook checkouts had increased by a whopping 353%. The RFID project was complete by the summer of 2012, allowing greater access to self-checkouts, quicker processing time, and a reconfigured checkout desk area. 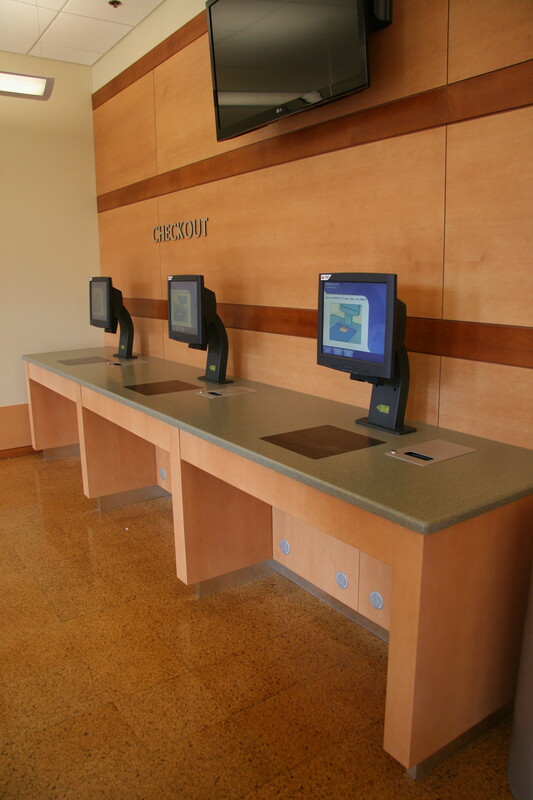 In January of 2013, a new service of wireless printing was available to patrons, and a dedicated area for Middle School students was created in response to evolving needs and library usage. In 2013, Summer Reading program sign-ups hit a new high. Nearly 5,200 kids participated in the program—over half of all eligible children in Elmhurst. Programs, raffle drawings, and a love of reading enticed hundreds of teens and adults to participate as well. Always striving to better meet patrons’ needs, in August 2013, the Library’s website was relaunched. In September 2013 EPL became a stand-alone catalog library, improving efficiency and easing navigation of the catalog for patrons. Also, at the end of 2013, the AV equipment in the meeting rooms was be updated to better address technological advances in the last decade. 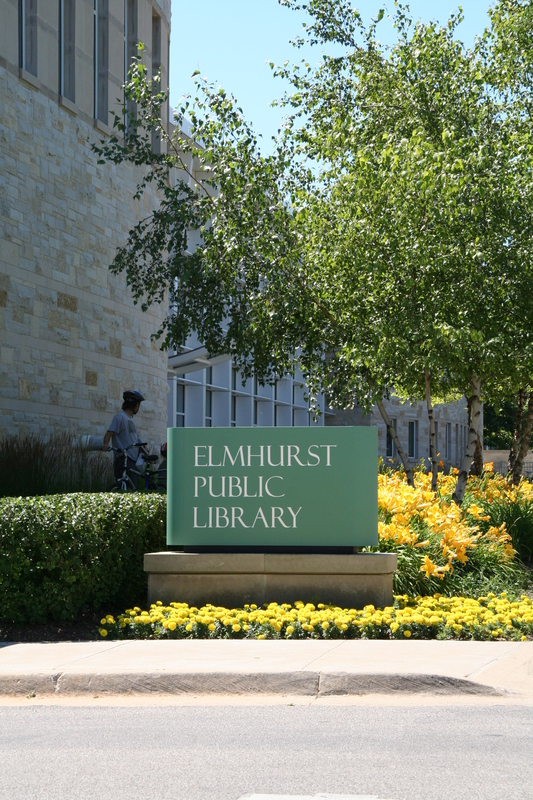 As EPL looks toward the next ten years and beyond, the Board of Trustees and staff continue to anticipate and meet the needs of the Elmhurst community. The Library strives to become the community hub for small businesses, local clubs, special interest groups, and individuals who seek resources and spaces to explore, learn, and grow. In 1868 Seth Wadhams built his home, which would later become the Elmhurst Public Library building. Pillars and a south wing were added to the building in 1937. After the remodeling, residents checked out books in what is now the audiobook area outside the Wilder Room. Immaculate Conception High School students studied in the Wilder Room in 1959. The addition was completed in 1965. The new building offered spacious reading areas, a new Xerox machine and a music and art room. The Glos Room after the 1965 addition. The card catalog was replaced with computer catalogs in 1994. With online databases, thousands of magazine and newspaper articles are just a click away. Southeast corner of the building during construction on September 5, 2002. In 2001 Elmhurst residents approved a $18.7 million bond issue to build an 80,000 square foot library. Construction was completed on September 5, 2003. Opening day on October 4, 2003 welcomed patrons to their new building. More than 5,500 items were checked out and more than 100 people got library cards on opening day. Housed in the lobby of EPL is a coffee shop and eating area. 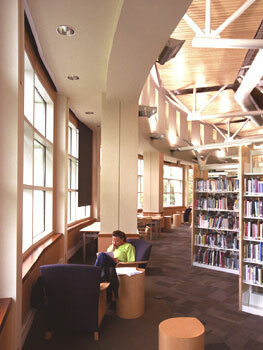 Seating throughout the library offers views of Wilder Park. An updated RFID system, installed in 2012, streamlines the checkout process. An automated sorter further assists in circulation. Programs, including the popular summer reading program, draw thousands of participants each year. 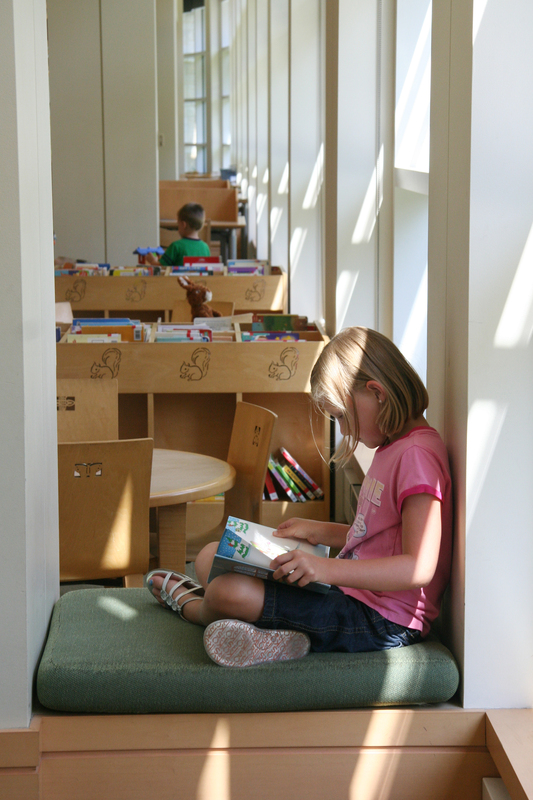 A child enjoys a book in the sunny, child-friendly Kids’ Library.